SkyView, the giant Atlanta ferris wheel located along Centennial Olympic Park in downtown is a beautiful addition to the skyline. View the rooftops from 20 stories up in climate controlled gondolas (not only are they air conditioned in the summer, but the heat is welcome in the winter too.) DISCOUNT TICKETS HERE. We had the opportunity to experience the Skyview ferris wheel during the holiday season. We were treated to a VIP gondola. VIPs are escorted to a comfy lounge area with couches to relax instead of waiting in line. The gondola itself is posh with a glass floor and leather seats. We felt like a high roller. My friend Diane visited Atlanta SkyView, with her kids during fall break to enjoy the view. Diane and her family had a lot of fun too, even though they didn’t purchase the VIP package. In her opinion, it’s a nice activity even for sometimes fussy tweens and teens. Here’s her take on the Atlanta ferris wheel SkyView. Take a spin on Atlanta’s highest attraction, Atlanta SkyView, located downtown overlooking Centennial Park — a 200 ft. Ferris Wheel in Atlanta. Each “gondola” seats six people, which was just right for two moms and four kids. After lunch in Atlantic Station, this rounded out our “get out of the suburbs” day in fine fashion. They say on a clear day you can see forever — it was quite overcast but we still saw all the way to Kennesaw and Stone Mountain. The unofficial word is that the line for the only Atlanta ferris wheel can wrap around the block if there’s a concert at the Tabernacle (next door) or on weekend evenings, particularly if there’s a big event in town. All kidding aside, our tween and teenage kids were all amused, camera phones snapping away, until one of the boys, who shall remain nameless, took off his shoes. Then we were debating whether or not an alarm would go off if we opened the “emergency ventilation” vents. 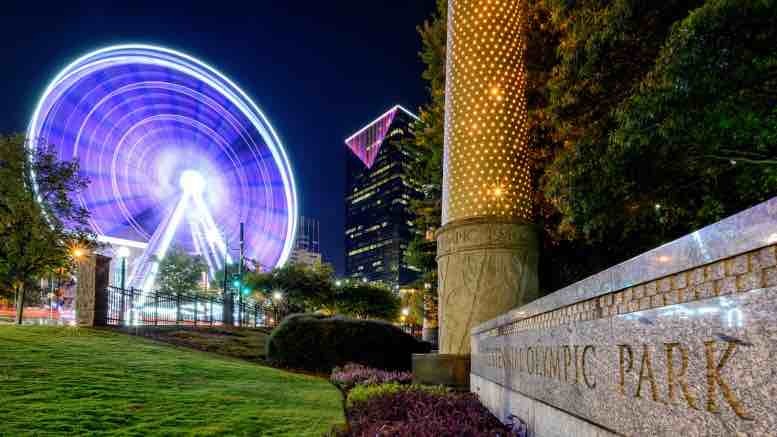 Before you head to the ferris wheel in Atlanta, check Groupon, Atlanta, Ga for discounts. We found several packages from romantic, to family friendly, to discounts on an annual pass. While you are in Downtown Atlanta at the Ferris Wheel, you might as well take in some of the other museums and attractions that surround Centennial Park. You’ll find the Georgia Aquarium, Children’s Museum of Atlanta, CNN Studios, World of Coca-Cola, Football Hall of Fame, and The Center for Civil and Human Rights. Be the first to comment on "Atlanta SkyView: Best Views from Downtown Atlanta Ferris Wheel [video]"